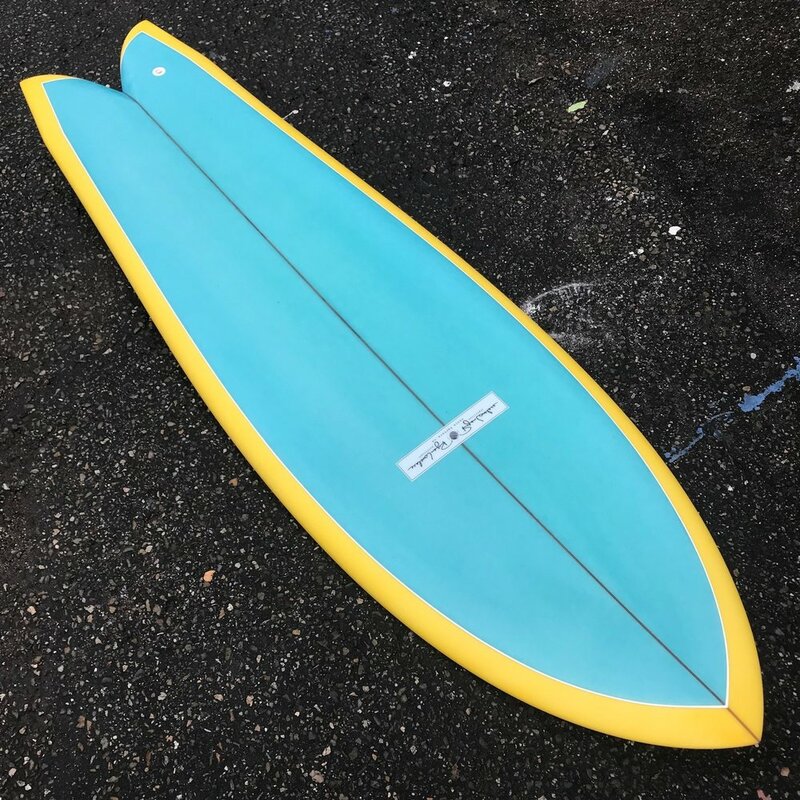 The slight acceleration in the outline that gives the Sidecut Fish its name essentially reduces the width of the board between your feet, allowing it to get onto rail much faster than a classic outline Keel Fish - They tend to be more effortless, and cleaner rail to rail, with a more intuitive ride in my experience, and they remain a point of interest for me as I play with the design. The first surfboard I ever shaped was a twin keel fish when I turned 19. I was inspired by Mick Mackie's section in the Andrew Kidman film Glass Love. Little did I know, and funny to admit now, what I was looking at was Mick's sidecut/incut design, which he has finally gained worldwide acclaim for, and which with my novice eyes, couldn't tell from a normal fish at the time. He has remained an inspiration to me and I've been lucky enough to watch him shape, as well as ride a couple of his boards - My 'classic' Sidecut Keel design is my take on his wonderful design, and the High Performance version featuring the hip/wing on the back foot is a step towards a tighter-pivoting more aggressive board, inspired by the mind boggling performance of Ryan Burch. If you want the real deal Mackie or Burch, I highly suggest you contact either of them for their work; these two are trail blazers in their own right and phenomenally generous people. If you'd like my take on the design, you've come to the right spot! I like to size these just like your classic Keel fish, if not a tad bit longer and narrower. For advanced surfers, I'll push you to go small and thin; for moderate surfers I'll size it just like a normal fish (but narrower given the sidecut), and for beginners that want to play with these things I'd say we go into the longer range, where thanks to the design, you won't be lacking much looseness rail-to-rail - I've got a 6'7 that feels like a 5'8 and I'm always excited watching people try it for the first time - it has re-defined what I thought a board that size could do.